Tor Benson has 21 things to love about inimitable Iceland. 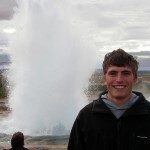 OSU students can find their own this summer by attending the Iceland: Civilization and Sustainability program. 2) Highest number of books published and sold per capita — with one in ten Icelanders writing a book in their lifetime. 12) Life expectancy of 81, which is three years longer than the US. name their children-or petition the government to approve a name. yogurt only much better, and flavored yogurt that they put on cereal. 18) Nightclubs are open until 6 A.M.